BellaCrochet: Happy Anniversary to Threadies! A Contest! Happy Anniversary to Threadies! A Contest! Time really does fly when you are having fun; it has been two years now since I told my friend and fellow designer Cylinda Mathews, "I wish there was a Facebook group just for thread crochet. I think I will start one." And even though I didn't have a clue how to go about it, I did. As I say, time flies, and the group now has over 8,000 members! If you are not already a member, I hope you will stop by and join us. The talent of the members is truly amazing, I can't wait to see the photos they post every day! The bird screws off the top so you can put the thread on the stand. My doily got a few of the usual "how pretty" comments, but what really caught everyone's attention was my thread holder. I had to confess, it was actually intended to be a toilet paper holder that I had bought off Ebay a few years ago. A lot of the members fell in love with it, and several actually ordered their own stands! I thought it might make a prize a Threadie would enjoy so I ordered a brand new one just for this contest. 3: The box will be shipped via USPS Priority Mail. 4: The contest will run from today (Nov. 14th) through Nov. 27th 2016. 5: I will select the winner at random from all comments left on this post and announce the winner's name here on the morning of Nov. 28th, so please be sure to check back to see if you won. 6: Only comments left on this post will be entered; comments left on Facebook, emails, etc. WILL NOT be eligible to win (it is too difficult to coordinate comments left in different places.) Only one entry per person, please! 7: If the winner does not contact me within 7 days of the end of the contest, I will select a new winner, and the prize will be awarded to them. Failure to contact me within 7 days will result in forfeiture of the prize. What is your favorite thing to crochet with thread? This is so generous of you!! What a great prize, Happy Anniversary Threadies!! Doilies.. I am addicted!!! I love this space you have made, here and in Facebook! Thank you for all you do! Happy anniversary Threadies!!! I can't wait to see what the next years bring!! I love making anything from thread. Congrates to you Elizabeth Ann White for then great group. I love crocheting coasters or mini doilies out of thread because you can get instant gratification from them, and they are so useful! Thank you for this giveaway...crossing my fingers that I get lucky! My favorite thing to crochet with thread- doilies. Thank you for being the only reason I log onto Facebook anymore! Love this group and really want to win! I love making ornaments for our Christmas tree and beautiful flowers. Snowflakes. I am just getting started but do enjoy it. Haha, this is thread holder such a great idea! When working with thread I usually have it right next to me bobbling about as I pull on for more, often lopping itself right onto the floor then gathering copious amounts of dog hair (we have 5 dogs and yes I vacuum often). My favorite projects being 3D angels. I like to crochet mantillas with thread, although the tablecloth I'm working on is pretty cool, too! I am not the most ardent doily maker. BUT I love making miniature items. I have made 6 or 7 mini afghans for my doll house friends using one strand of embroidery floss and my Grandmothers lace crochet hook. Quite tedious. I love this group! I have seen so many gorgeous items. Right now I'm working on a table runner (about 40 inches long when finished) of Santa Claus and 8 reindeer flying over pine trees. My favorite projects are small doilies that I make in sets for use as coasters. Thanks for everything you do. Great giveaway. I love making doll dresses out of thread. Tablecloths doilies and crinolines are what I love to make with thread. In looking at the prize, I can see where it would have been a Victorian paper holder but I think it has much great use as a thread holder. Absolutely love it and the Threadies. Happy Anniversary and thank you for the gift of the Facebook group. I LOVE to make doilies, tablecloths, bedspreads, and especially CHALLENGING patterns- Can you say Trish K?!! LOVE HER DESIGNS!! The thread holder is beautiful and very practical as well! I love crocheting doilies from thread, and also enjoy smaller projects like bookmarks, Christmas ornaments, etc, that can be completed in a couple of hours. These days I seem to make mostly doilies and Christmas decorations, but my favorite things to make with thread are Christening outfits and doll clothes. To my favorite thread designer, Ann, thank you for Threadies and Happy Anniversary!! Dollies are my favorite, but I also really enjoy snowflakes and Angel ornaments. 2 years & 8,005 members. That is really something to celebrate! I learned to crochet making what Grandmother called dish rags. I recently found one of them and was surprised to see that it was actually done following a filet crochet pattern in thread. The pattern was on graph paper, that she had to have made from a lined tablet, was safety pinned to it and was dated Summer 1961 and my name printed on it. I would have been 7. I love vintage things. That holder is to die for@!! I love to do filet crochet with thread however my favorite doily to make is the Prairie star doily! First of all, thank you for starting the group Threadies. that I have gotten back into the craft. Doilies of course and large centrepieces! Happy Birthday Threadies! And it's my birthday too! Doilies, runners and filet projects! I love being part of the Threadies, Happy Birthday! Must say doilies, too! Since I joined this group and discovered the beauty of using colors other than white and mixing in varigated threads, the possibilities are endless. I enjoy making snowflakes this time of year also. Doilies,then vintage looking potholes...I am Judy Starr Kalo on fb threaded....this is so nice of you to do..
First of all, a huge thank you Elizabeth Ann White for forming & maintaining your facebook group Threadies! Absolutely the best group with the greatest members ever! Can't express my gratitude for all the inspiration I've gained here. Secondly, another thank you for this contest. Besides the chance to win the holder, it's a wonderful opportunity to mingle with fellow Threadies. I fell in love with thread crochet at a young age, and began making doilies & runners when I learned the craft. I've branched out to a few accessories & pieces of clothing in the last few seasons (& want to make some filet curtains), but always come back to doilies in between projects, so I must admit doilies are my favorite things to crochet. I use them throughout my home & they always make a great personalized gift for just about any occasion. It's so difficult to name just one thing, but I would have to say named pieces for monumental events, like wedding dates, anniversaries, or baby births! Hummmmm. Favorite thing to crochet with thread....well I make more doilies than anything but have made a few tablecloths. Also Angels, ornaments and bowls. Thanks for the Threadies group. It's inspirational! When I first saw someone post that they had gotten this thread holder, I fell in love. It a very nice thing for you to run this contest to celebrate. Thanks! I taught myself how to crochet at 8 years old. Today, crochet has become my stress reliever and anti-depressant after losing my husband and my job. I love to crochet large projects like tablecloths and bedspreads. It brings me joy to see these beautiful pieces come together and to see the faces of the recipients when presented to them. Thank you for the Threadies group, which allow me to connect to other crocheters around the world. Happy anniversary. I like making coasters and sun catchers. They work up pretty quickly and can look so different depending on what colors you use! I was just wishing I had a thread holder, so that's a sweet giveaway. I have been a Facebook group Threadies member almost since the beginning. It has been a lot of fun to see the group grow! I've watched many members' thread crochet blossom over time, to become outstanding works of art. My stitching has improved from the many tips shared by other members, and I have found some new-to-me designers to add to my favorites. I have also been able to share some of my favorite techniques. This group is the best for sharing and enabling each other, isn't it? One more bonus is that I have made some awesome friends in this group. I am not entering the contest for that adorable thread holder, but wish the best of luck to each of you who are entering! I love to do doilies with thread, although, my all time favorite projects have been small doilies, stars, hearts etc. that have then been used as appliques on quilts. I have so enjoyed the Threadies group. It is a tremendous encouragement. Thanks for all you do!!! I love the Theeadies group, so inspirational! Happy Anniversary! This group with the beautiful photos everyone posts on FB has inspired me to do more thread crochet projects. toys, shawls, it doesn't matter. What ever is on my hook is my current favorite. I love any thing made with thread. What a lovely prize! Thank you, Elizabeth, for holding this contest and especially for creating and administering Threadies! My favorite thing to crochet with thread is vintage doilies. I love keeping the patterns alive by making new ones! Doilies, of course, but also angels and Easter eggs and table runners and ornaments and snowflakes and doll clothes and baskets and pillows and bookmarks and, well, you get the idea. Happy Anniversary Threadies!! I love doilies and am a threadie at heart, was so excited to have found this group a year and a half ago, it has inspired me and taught me so much more (also a bit lighter in the $$ department) lol thank you for the group and congratulations!! Ooo, I love it. Thank you so much for the contest. I love the Facebook group and your website. Truly enjoying a community that loves using thread. I love to make doilies! Then again I love doll clothes and flowers as well. This is so very thoughtful of you. I love trying new doilies with thread. I haven't been doing it for too long so still learning and enjoying the results. Hi. This is Kitty Hoye Brewer. It would be such a blessing to win this contest. I learned to crochet using thread while still in high school. I would sit in class (right up front - got away with it cause I was teacher's pet, aka Miss Brown Nose), but when I picked up crocheting again (8 years later), it was with yarn and that's all I used in the past 45 years. I get so excited seeing all the beautiful things posted in Threadies that I am anxious to try thread again (have purchased tubs full in anticipation. Thank you for starting this group and for the chance for someone to win this lovely gift. Happy Anniversary Threadies. Tablecloths, the more complicated the better. Thank you! Happy Anniversary, Threadies! I love you all, so happy to be a part of the best group on Facebook! Doilies, Doilies and oh yeah more doilies. Plan on making some Barbie clothes for my granddaughter. Happy Anniversary. I love to make delicate doilies with thread. Since joining this group I have been so inspired that I have difficulty putting my hook down! My sincere Congratulations on reaching 8000 members; this is a wonderful group! Thanks again for a great group on Facebook and congratulations on the 2 year anniversary. My favorite things in thread are, like most, doilies. My favorite thing to crochet with thread is a "Challenge." Whether it is a doily, sculpture or amagurumi. I do love the Vintage doilies. I love making doilies but I would like to learn how to crochet clothing with thread. Happy Anniversary. This is a wonderful group to be part of. How wonderful! I love Threadies, this blog; just a wonderful way to while away the time (when not crocheting, that is!). My very favorite item to make with thread is doilies. I was taught by my Memire at a very early age. I can remember sitting and watching her fingers fly as she made the most spectacular things. I was blessed when she passed to receive her threads, books, and hooks and every time I use them I am transported back to sitting on her green leather poofy stool, talking and laughing and learning crochet and drinking tea like the grown-up I thought I was at 8 years old. Thank you for all that you do to keep the art alive! I started learning thread crochet as a child and my grandmom said, simply keep going around. Add or remove extra stitches as you go and there you have a pattern! Doilies were and are my all time favourite. But, Threadies has turned me into an obsessive table topper fan! I looked at all the work here and with so much of experience and talent, I just couldn't stick on to doilies!! My best crochet work happened after I got here! And boy, my love just doubles! Happy Anniv!! Doilies are great fun, but my favorite thing to make is a Christening Gown. I love seeing them on the baby at a baptism. I like making logo's with thread. I love taking a standard afghan pattern and working it in thread. I think intricate patterns show up so well in thread! Beautiful piece for holding thread. I love all kinds of thread crochet, but I thin my favorite thing to make is miniature toys, the most favorite are tiny jointed bears. I love the look on children's faces when they see them and realize their arms and legs move and they can make them stand, sit, etc. Toys are the most fun things to make and give!. I am just learning to work (still) with Thread,I've made and frogged many a doily so far but am GOING to get it,I am!! Doilies are my absolute favorite. Have been crocheting them for 40+years.angels and snowflakes and bookmarks are next on the list. I love everything with thread! Angels, Dolies, ornaments, and anything else you can make. My grandmother taught me 45 years ago and I loved it ever since. Thanks so much for the wonderful group we have! I love Threadies on Facebook. I enjoy seeing all the pictures and information on patterns. I have been crocheting since 1973, my mom was showing my sister and I how to make granny squares. My sister got the hang I it right away. Me I couldn’t make it square I got mad and decided I would make something else so I went to WT Grants a department store in the area and found Coats & Clark book no.222 doilies. The first thing I ever crocheted was a doily, the one on the cover of that book. I was so proud of myself. I have been making doilies ever since. To me it is my stress release. Thank you for Threadies. Threadies is one of my favourite Facebook groups, and I say this as a member of hundreds and admin of several very nice groups. It is warm, welcoming and a great place to learn. Thank you very much for making it what it is. I remember coming to your blog for a pattern and then reading about the 'new group' you'd started and promptly signing up! Hi I'm Sherri and I love making all items with thread. But I really love doilies in all shapes and styles. Hi all, Consuelo here and I love all the inspiration from this wonderful group. I love everything I crochet. I also love the group and how helpful everyone is. It's kinda like sitting on a front porch in the South with some sweet tea and cakes, chatting about stuff. Makes me miss my nanny! I learned to crochet for just one reason; to create doilies. I have crocheted well over a thousand and still never tire of them. There is something always challenging about creating with thread. Oh my goodness...anything out the Magic Crochet magazines. You can find anything from doilies to umbrella patterns. Could you imagine the designs they'd print if it was still being published? It boggles the mind! Happy anniversary Threadies. What a lovely prize.I am going to try my luck. I love making doilies with thread but recently have also been making dolls clothes.it is so versatile! I love to crochet Christmas Doilies.i love the thread holder. Doilies. I love making them and now that I have found your group and blog I am back crocheting more doilies. My favorite is a doily or table runner. Just love how delicate they look. I love Threadies and your blog! I also love this crochet thread stand. I returned to my love of doilies when I joined Threadies and found a group of wonderful people to share my passion. I learned to crochet in my teens and started with doilies. Keep up the excellent work! My absolutely favorite thing to crochet is doilies, especially pineapple ones. Unfortunately, I cannot crochet with the fine thread as much as I like due to nerve and muscle neuropathy that affects my arms and fingers. I still try to make them periodically. Takes me quite a bit longer to complete than when I was younger but still enjoy making them! Would love to win the bird stand to hold my cotton. Thank you for the chance to win. My favourites in thread are square doilies, runners and Crinolines. I'm happy to be a part of ' Threadies'. Happy anniversary! Doilies, doilies and more doilies. I like to think that I am caring on a family tradition with my crochet. My grandmother taught me when I was 10, I have loved it ever since. I have only been thread crocheting for a couple of years,and I instantly loved it. I joined your group when we were less that 2000. This is my first stop "after coffee" each morning. I love having coffee with friends. Thank you Ann and all the other admin for your hard work in making this the very BEST group on Facebook. I crochet 3 rows around 1 yard square of baby flannel - or cotton lined with solid color flannel - to make crib blankets. I have made a few pineapple bookmarks and small doilies but my main focus is on the crib blankets. So many patterns and colors too choose from. My favorite thing to make with thread is a doily. Just to take thread, a hook and a pattern to make a beautiful item is very satifying. Beautiful prize! My grandmother had one similar with a bear on the top. When she passed away however her son sold it instead of handing it down as she had requested. This group is awesome and I have seen some wonderful work and found lots of inspiration since joining! Happy Anniversary to all Threadies and here is to another productive and creative year. My favorite thread item is doilies with overlay stitches done in multiple colors. What an ingenious way to use this little bird as a thread holder..super group you got started...amazing work by everyone n such friendly n encouraging members.. I like making jewelry and inserts for clothing with my thread! Thank you for the group nod this drawing! I love to make doilies and table runners for gifts and the different seasons! I wish you Happy Anniversary. Doilies are my favorite as well. I really enjoy the Facebook group and seeing everyones work! I've done doilies, coasters, a kitchen curtain valance and thread shrugs. and I've used a paper towel holder for my thread. I began as a 7 year old crocheting with thread. It has always been my favorite form of art. It is so noce to be able to relax and look at the beautiful creations on Threadies. Love the "thread holder" and the Facebook site. I'm inspired to renew doily-making! The favorite item I love to crochet with thread is Angels, then I will give them to family and friends who are having difficulties. 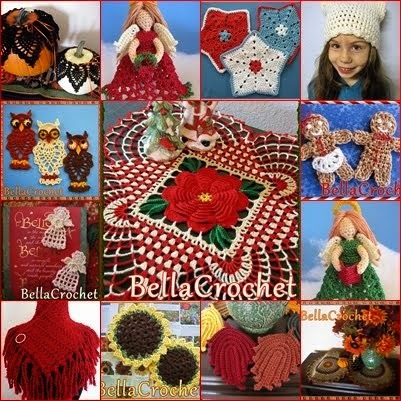 So I am always looking for new patterns to use and yes I have crochet the Christmas Angels you have on your site. Can't explain but I have a sense of peace and relaxing when crocheting Angels. Then I try to attach a note of encouragement. Thank you Elizabeth for all your hard work. Doilies, of course! I first started out crocheting afghans way back when and then I saw a doily on the back of one of my mom's chairs and as I gazed at the beauty of it, I wondered if I could crochet with thread, so I went to Michael's, bought a ball of thread and a doily book and that was it; I was hooked and still am! This would make crocheting with thread so much easier! Doilies is all I have ever done with thread. Is there anything else? It is so very lovely. So many patterns...so little time!! My top item to crochet is doilies, using as many colors as possible! I love crocheting Mandala's. I started following Wink's work a year or so ago and just fell in love with all of the possible color combinations. These thread mandalas also inspired my daughter to begin making them with yarn. Wonderful! I also get to decrease my stash a bit (but if I find a good deal, the stash always goes up again...)! Hello & Happy Anniversay. I enjoy crocheting bracelets & necklaces, giving them to the little girls. They get so excited. I love to crochet earrings with my thread the most. It is so relaxing and therapeutic after a long stressful day. But I also like making doilies with it too. Well, it would be a tie between doilies and crochet thread jewelry. Since I must pick one, I'd have to go with doilies. I just love to see them develop as an complete rounds, and how it feels when they are done, and I see them, and can't believe "I did that!". I have made everything from bikinis to curtains but my favorite is Christmas ornaments. Bells, angels, trees, stars, anything! I love to crochet doilies most of all. They challenge me and I like that. Vintage thread crocheted potholders are a passion and addiction for me. I love the old vintage doilies, but I can't seem to turn down those darn potholders and hope that the art of crocheting them as well as doilies, never fades from this earth. The thread holder is adorable, and if I don't win it, I wish the best to the crocheter who does. Pam Bates. I love to Crochet Doilies with # 3 Thread. I enjoy seeing everyone's works in the Threadies Group. I love to crochet little thread snowflakes! I try to give a few to each of my family every year at Christmas. The bird thread holder is adorable and something I need. My favorite thing to crochet is Christening Gowns for babies. I love to Crochet Dollies the most.Thread crocheting is my passion. Hi, you are so awesome, Threadies is a dangerous place to play and drool, so many wonderful pieces of work. Thank you for all you do!! Trying again- this time via computer. I love making miniatures and currently started trying amigurumi objects in tiny size. Seems redundant, I know, but I like to see how small I can take something. Thank you for all you do for the Threadies group! I love your work and designs; I'm hooked! I have so many favorites that I love to crochet it is difficult for me to decide which is my favorite. Having said that, I love filet crochet whether it is a runner, curtains, chair sets; filet it is! Hi, my name is Wanda Watson. I love making doilies the most but I like to make jewelry too. I love making Doilies, and doll clothes with thread. Happy Anniversary Threadies!!! I have a passion for doilies, I love them so much and drool over the post of them everyday, yet I have not made one. The first thing I made with thread was an Indian Doll set Man/Woman with bead work from a Leisure Arts booklet many many years ago. I still have that set of dolls and love the detail in the work. This year as I start slowing down at work I hope to start making doilies. I want a house full of them!! Happy anniversary to the group. I love to crochet doilies. Great prize. Good luck to all the members. I've done a small version of full-size afghans with interesting stitches. I find the thread provides better definition than yarn. Either that, or I'm just a glutton for punishment! Either way, Happy Anniversary!! This is awesome :) I love to crochet and wish I had more time for it! Having four jobs doesn't help. Oh well, happy anniversary! I am really not sure what I like to crochet in thread I am just beginning. I have done a doily so far. It was much easier than I thought it would be. I was very afraid. But not so much anymore. Happy Anniversary! I'm new to Thread Crochet. I am soooo addicted!! 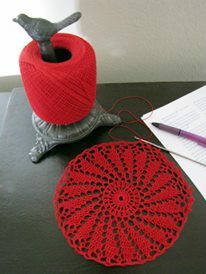 Thanks to your blog, I was lucky finish the Peppermint Doily, and am now browsing your blod for my next project. Thank you!! I love doilies best of all! My last project was actually a huge circular shawl that I adapted from a doily pattern. After spending 10 months on that, I'm having a hard time in deciding what to make next. It'll probably be another doily...LOL! I love making filet crochet with of course steel needles, antique preferably, and the super thread holder would save me from chasing the thread across the room chased by the cat..
Buggy Malone from the south east of England. I learned to crochet with thread many, many years ago! Just miles & miles of chains before my mom was happy with my tension. Doilies are still a favorite although I get involved with table cloths & bed spreads every so often. I love your patterns! I just finished the Peppermint doily! And my favorite is anything new to try!! I love making angels from thread. Definitely doilies! I thought I was one of the few left that love to do this, came here and found out there was a bunch of us! Dollies....doilies...and more doilies!! I'm always seeing just one more that I want to make. Most of them are given away to people that appreciate the love that went into making them, which gives me a blessing. My fav thing with thread is definitely doilies! I thought I was one of the few left that love to do this, came here and found out there was a bunch of us! I love making doilies and it's so nice to find other crocheters who do. Most anything. Probably pillow & towel edgings..I even put a trim on my socks!..Just made a curtain for the bathroom. And I Love Doilies too. I would use it to crochet dolls. I am addicted to making doilies. Even though I do not have space for very many that does not stop me. This thread holder is beautiful. What a great prize. I'm only new to thread crochet. I like to make doilies or trayclothes. I am only starting out working with thread. I would love to challenge myself by moving from doilies to larger items like bedspreads & table runners. Crocheting doilies is my passion. No matter what pattern I look at, I'm drawn to thread / doilies. Congratulations of our 2nd b-day!